I sold the previous pine dining table that I made just before moving in to our current home. That made it one less thing to move and I figured I would just make a better one when the time came. We’ve been in our current home for just under two years with no dining table the entire time. Well….I moved our outdoor patio table inside this past winter for a temporary dining table but that doesn’t count. It’s ugly using it inside and it needs to go back outside since we are starting to have nice weather. I will miss those padded swivel chairs though. This project has been delayed and delayed and delayed for several reasons. Mostly because I couldn’t decide on a table style. I went back and forth between mission style, trestle style, shaker style, and back to mission style. I did end up back at a mission style base but I’m not entirely sure on all the details at the moment. And secondly because my wife hasn’t given any input on the design as she just wants it done. That’s a very dangerous situation for a husband as no matter what decision I make it will most likely be the wrong one! I knew what my requirements for the table top were so I went ahead with building the top. The dimensions I chose might be a little on the small side for most but they fit my needs/wants as I really don’t want or have room for a large dining table. I wanted a table that wasn’t too wide as we typically play board games at the table and want it to be relatively easy to reach the other side. Obviously enough width is needed for two people sit opposite each other and eat. And the length needed to be long enough to sit at least two side by side comfortably. The max seating at this table will be four people. I also decided to venture away from normal with the materials and chose hickory for this build. The material I purchased was rough sawn but already skip planed. I chose the four flattest boards to start on the top. 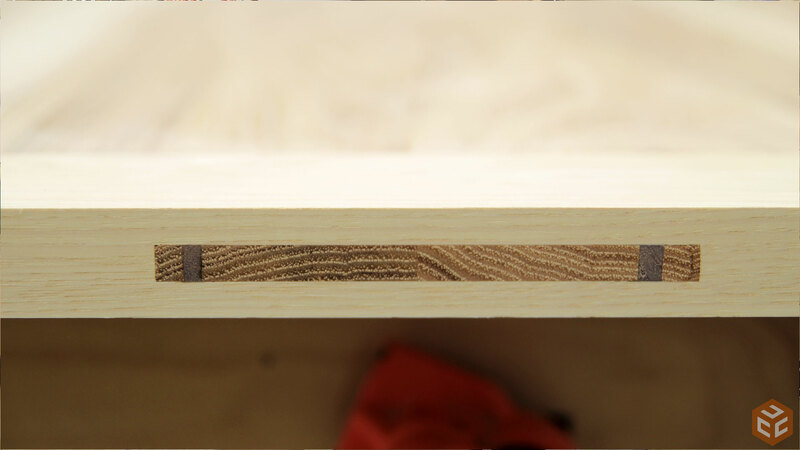 For symmetrical contrast I also picked out a very clear piece of white sapwood for each of the breadboard ends. All of these boards needed to be slightly planed to ensure they were all the exact same thickness. After planing I jointed one edge flat and square to the wide faces. 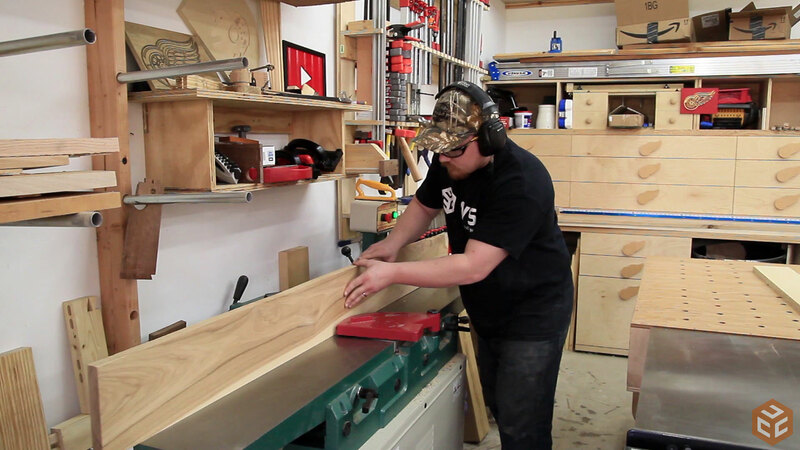 Since getting my jointer I think every piece of wood I’ve used in projects has passed over it. It really makes life easier in the shop. With one jointed edge I could rip the boards to their final width at the table saw. All of my top pieces are now flat and the exact same thickness. 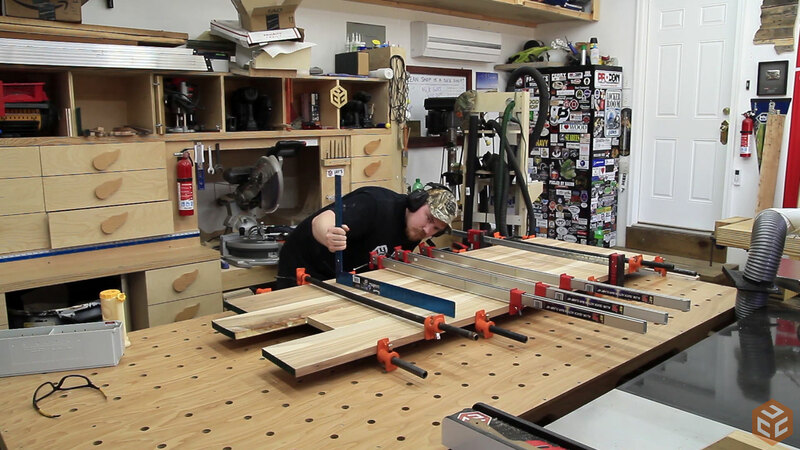 To prevent any of the boards from shifting during glue-up I used floating tenons. When gluing panels together using a biscuit joiner is a great way of ensuring little to no movement while in clamps. I don’t have a biscuit joiner so I used floating tenons in the same way biscuits would be used. While using biscuits or floating tenons will prevent the boards from shifting at their joints you still need to make sure the entire panel stays flat. 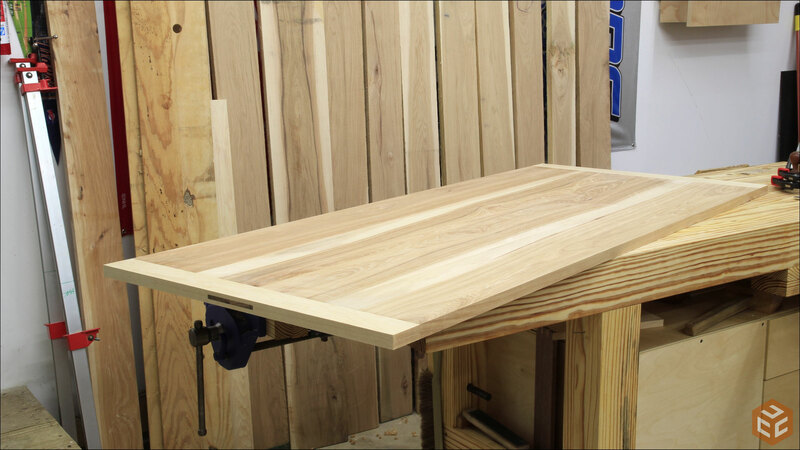 It’s very easy to use too much pressure from the clamps on one side and cause the panel to bow up or down. It’s also very easy to tell by eye if this is happening. 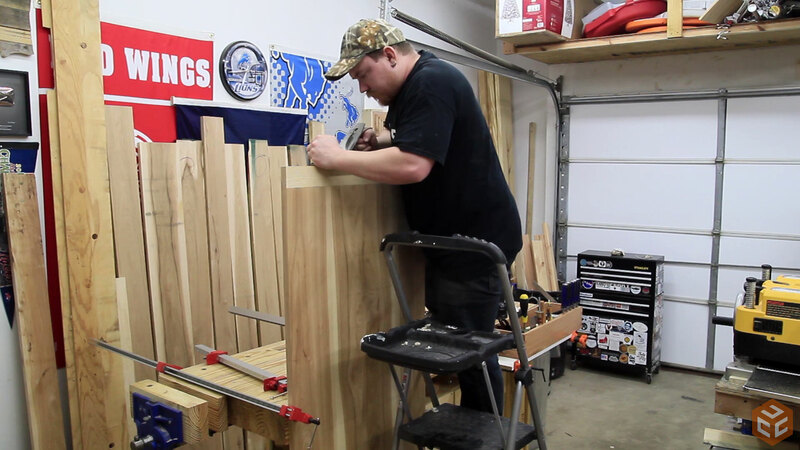 After putting all of the clamps in place I used a straight edge to let me know if I was indeed bending the panel. Everything looked good so I let it sit overnight. The next day gently scraped off any glue residue and started on the ends. First order of business was to square up each end. 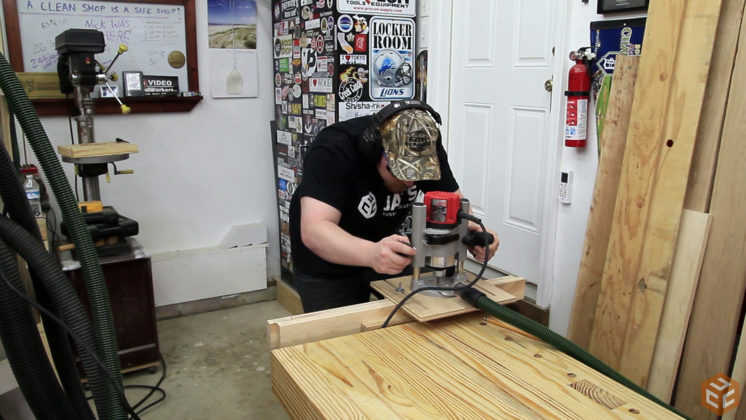 I used my circular saw track to make a nice straight cut with my circular saw. I really dislike using this method these days as I have no dust collection on that saw and it just sprays dust everywhere. With a nice clean end cut the joinery can be laid out. 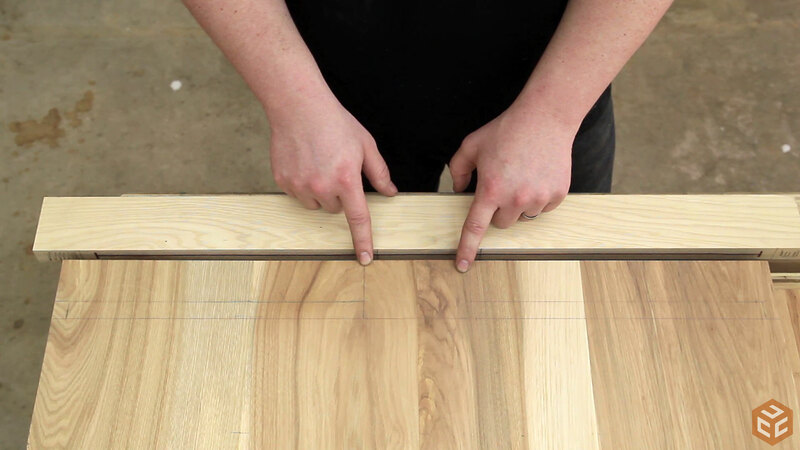 For those who don’t know, the purpose of a breadboard end is to keep a wide panel flat over time. 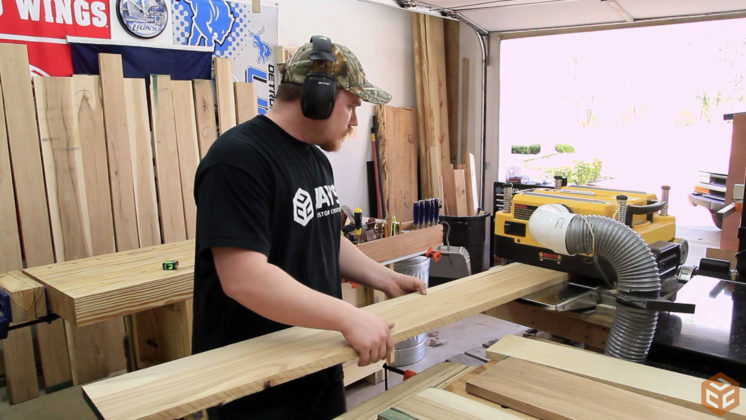 Because wood expands and contracts it is also necessary that the majority of this joint be floating and not glued in place. There are many ways to make breadboard ends but I chose to do something a little different. I wanted the middle 4” of the joint to be a wedged through mortise and tenon joint to lock the breadboard end in place. This is the only point where the joint will be permanently secured. The rest of the joint will be a hidden tongue and groove joint. This will allow the rest of the panel to expand and contract but still be forced to remain flat and not warp. I drew the joint on the panel so I could see the game plan. I started the joinery by cutting the groove and through mortise in the end pieces. 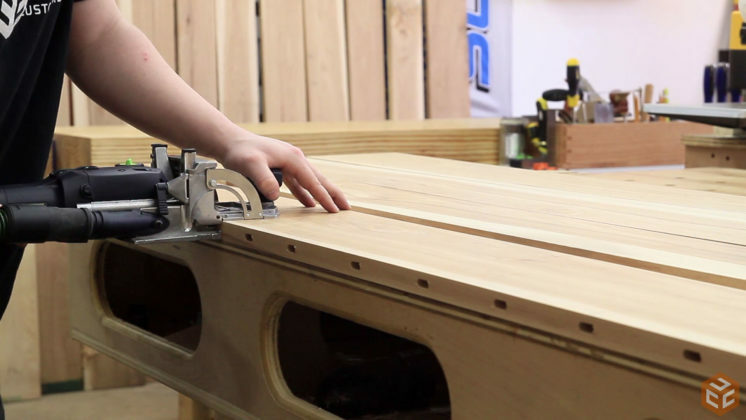 A plunge router and an edge guide attachment makes quick work of this process. To ensure the joints were perfectly centered I first centered the 1/4” spiral up-cut bit as best I could and then made all of the plunge passes from each side of each board. And here’s what each board looked like. On the inside faces each board had a groove that was slightly more than 1/4” wide and 1/2” deep and on the outside faces the through mortise is exposed. Next up is sizing the male end of the joints. First the router depth needs to be dialed in. 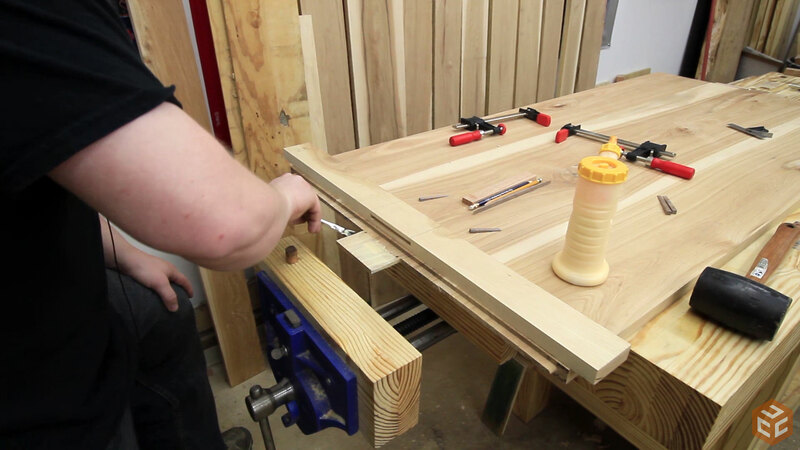 To get a more accurate starting point I clamped the breadboard end to the end of the panel and used a marking knife to transfer the groove measurements to the panel. In the lower right you can see the waste area that I used to dial in the router depth. The only downside of using this area to dial in the router was flipping the panel over each time to route from both sides. It only took a few adjustments though. 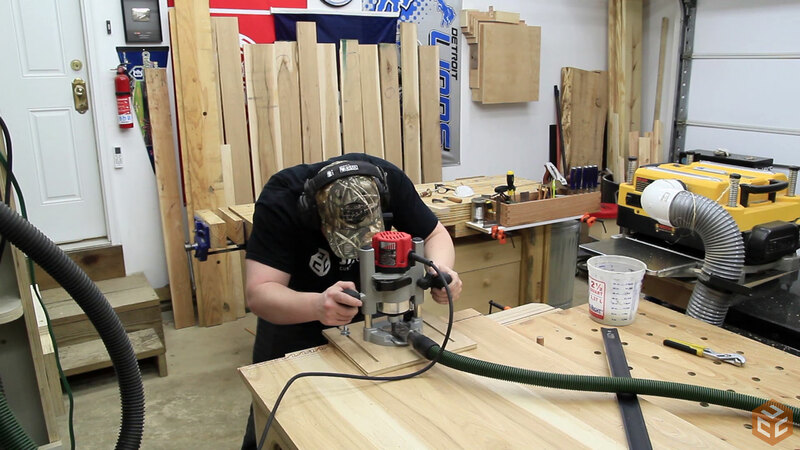 With it dialed in I used a straight edge and my marking knife to sever the fibers where the router bit would cut. This will prevent tearout at the joint. 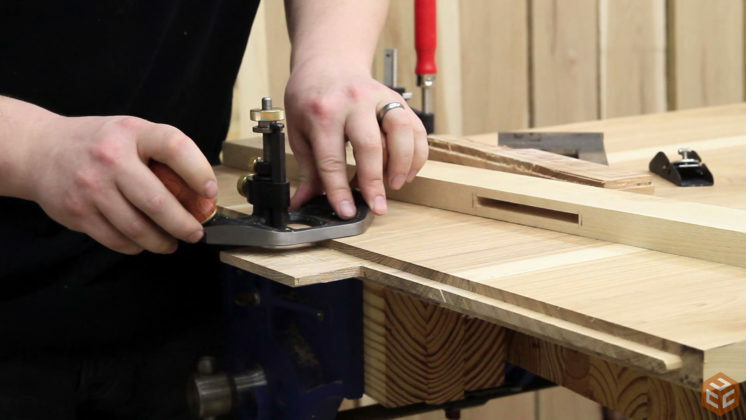 The router and edge guide make quick work of the tongue as well as the through tenon. As you can see I left the extra waste material as it helps support the router when making the through tenon. I used a hand saw to establish the width of the tenon. Then the bulk of the waste can be removed. I used a jigsaw for the first one then realized I should have used my battery circular saw as the cut would have been a little cleaner. To make sure the tongue and groove joint is hidden from the ends I chopped off the corner of the tongue. Then pared back to the shoulder to clean everything up. I made sure to cut the tongue and tenon just a smidgen thick so I could take the thickness down more accurately by hand. I wanted a perfect fit and finally got a chance to use my new router plane that I received as a gift from Nick Ferry. It’s a perfect tool for this task. It really made quick work of fitting the joint. With a test fit confirmed on the breadboard end I can focus on making the tapered mortise. This is an easy process. Simply strike a line 1/8” or so to the outside of the established mortise and chisel the mortise to those lines angling the chisel in by 5 degrees or so. The new angled face of the mortise should taper in to the approximate start point of the tenon. The mortise is tapered because the tenon will eventually be wedged out to form a dovetail shape. 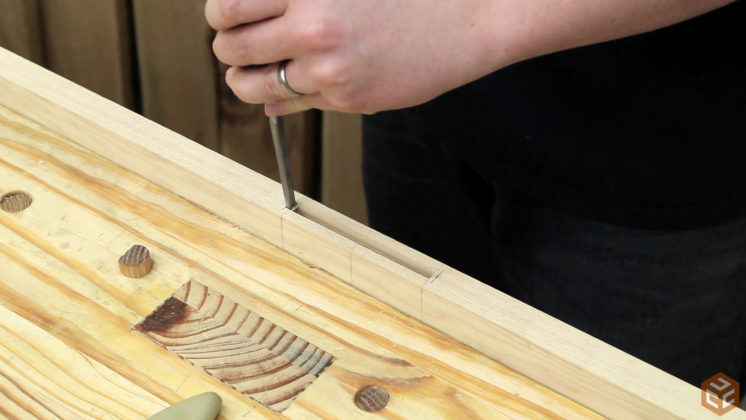 This process starts by drilling two small relief holes near the base of the tenon. Then two saw kerfs are cut about 3/16” in from each side. These kerfs are where the wedges will be driven forcing the ends of the tenon to splay out and lock into the tapered mortise. 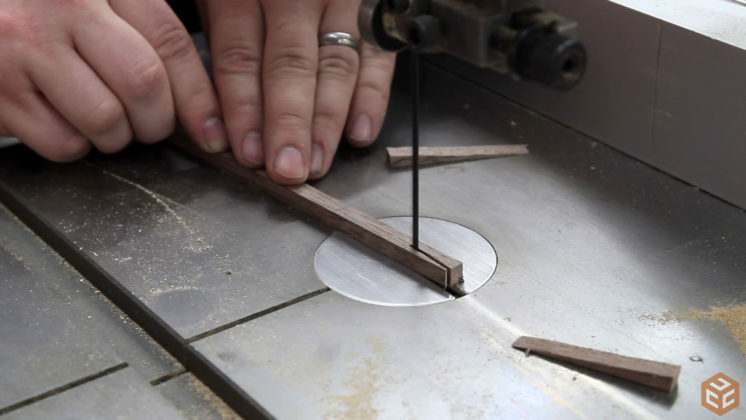 Then a rough wedge shape can be cut at the bandsaw. See those off cuts from the previous two wedges? I should have tossed them in the trash. I’ll tell you why in a bit. 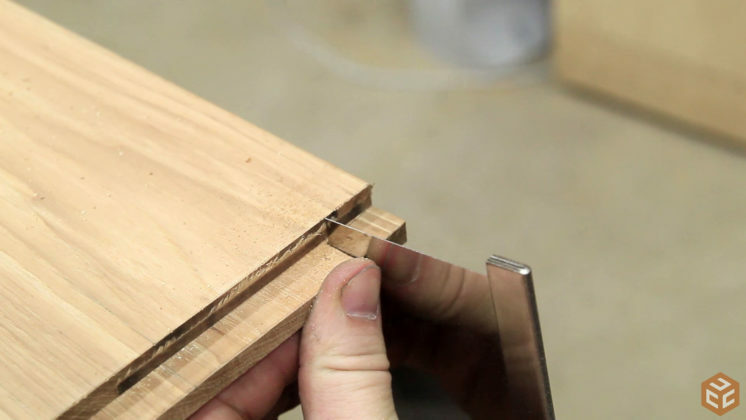 One way to keep the breadboard joint tight over time is to make the joint a sprung joint. 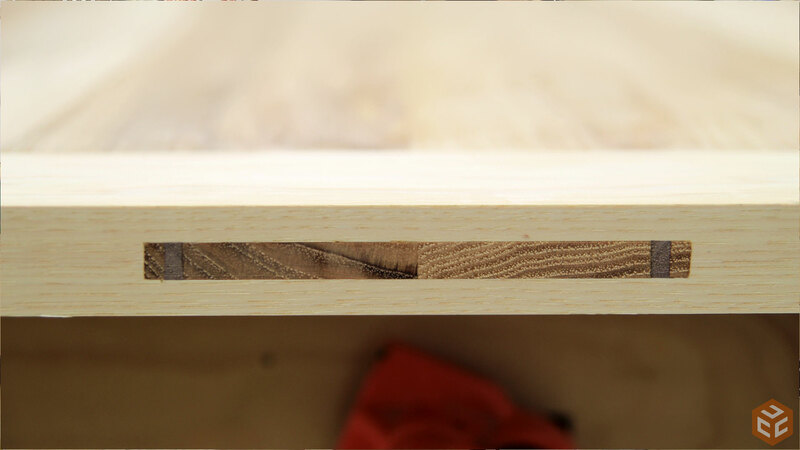 To do so a little bit of material is removed with a hand plane from the inside face of the breadboard end only in the middle. This creates a concave surface at the joint. 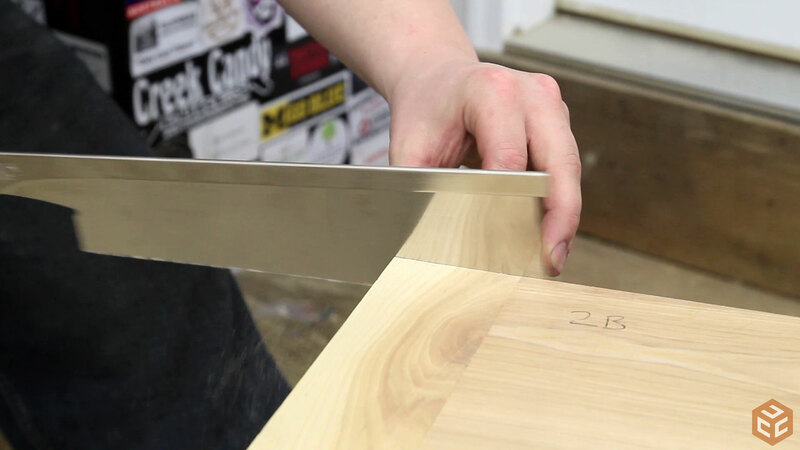 When the board is driven into place the outer edges of the joint contact the panel first. 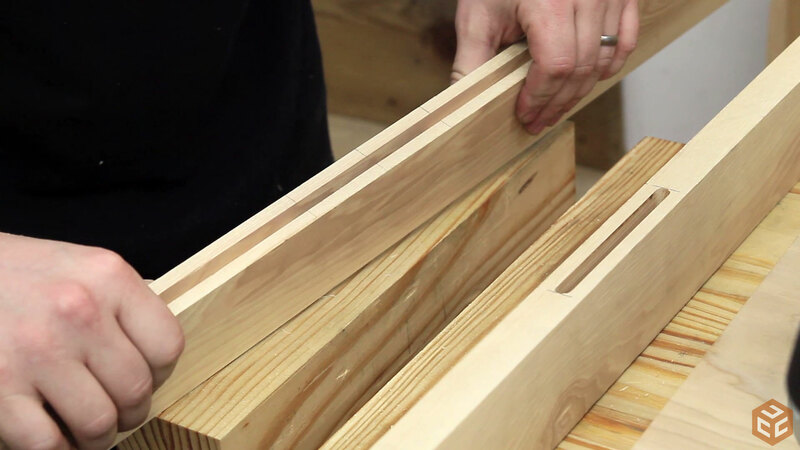 Then the joint is clamped closed in the middle which results in a nice tight joint with constant pressure along the outside edges and a joint that will remain tight over time. My boards already had a slight hollow in the middle so I didn’t have to use a hand plane to establish the spring. With everything looking good I started the assembly of the joint. First a bit of glue is added to the tenon only. Then the breadboard end is installed and driven home. Because I didn’t have any clamps long enough I used my workbench end vise and dog holes to close the joint. Finally the wedges could be driven home. After allowing the joint to dry for a bit I chopped off the extra length of the breadboard ends with a hand saw. And finally planed the breadboard ends and through tenons flush with a hand plane. I had to stand the table top on its end and clamp it to the workbench for this. Here’s a picture of the good joint. Everything is symmetrical and there are no gaps. And here’s the bad joint. There are no gaps but the symmetry isn’t perfect. On this one I made an error and grabbed the off cut from one of the wedges and used it instead of the actual wedge. It ended up not being long enough as once I had it fully seated into the saw kerf the outer portion of the tenon hadn’t bottomed out with the tapered mortise yet. It was fully seated so I couldn’t remove it either. I panicked for a second and decided to cut a quick taper wedge and use it to fill in the void and complete the joint. Structurally it’s good but if you look close at this joint you can see the mistake on the right side. It’s not a huge deal as you have to get really close to notice it….but it’s there. I’m not beating myself up over it though. Lesson learned. I’ll never make that mistake again. Here’s the final table top before finish. I gently scraped away all of the pencil marks but I still have to do one final surface prep once the base is completed. Then I will apply a clear finish to the entire table. I really like the direction of this project so far. The top turned out better than I had anticipated and I really love the grain selection. very nice work, well documented. I always like to follow you through your projects. Good save and that for sure is a tiny mistake! Interesting joint as well. Thank you for stopping by Breid. A very interesting and craftsmanlike project. I’m looking forward to the rest of the new table build. Well done. Thanks Rebouchage. I appreciate it. Excellent result – you should not have pointed out the wedge matter – we would not have noticed. Not sure about the mission style legs – bit fussy most of the time – and this time especially for the top. Sometime I don’t point out mistakes but I felt like sharing this one. Thanks for stopping by Hedware. Sometime I don’t point out mistakes but I felt like sharing this one. Thanks for stopping by, Hedware. I agree with the choice to show it. It’s an important tip. I’ve made similar mistakes in other kinds of projects, where the scrap and the workpiece are similarly sized. For special cuts like this I’ve found it helpful to plan my angles, when possible, so that the workpiece and the scrap are the same. Not always possible, but it saves time when it is. 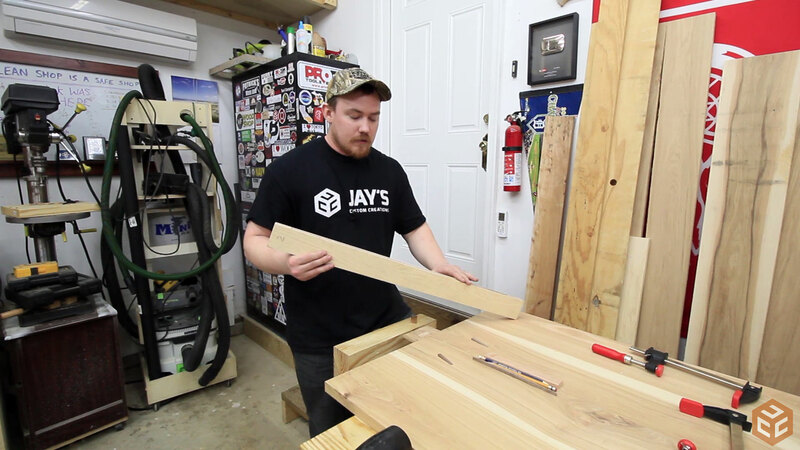 That is one nice looking table top you have made Jay. I like everything about it, even the mistake. People get to wrapped up in perfection. Mistakes is what makes a project one of a kind. Especially that little mistake you made. I couldn’t really see the difference. 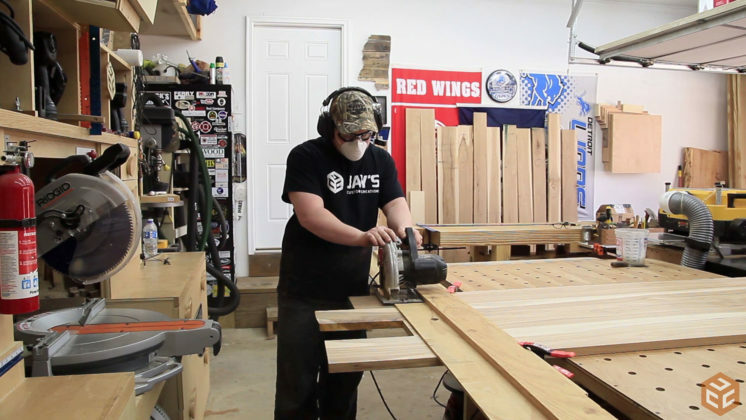 Nice work Jay, i have a dining table on my “honey do” list as well. Been putting it off because like you i cant come up with a design i really like. I look forward to seeing what you come up with. As always I appreciate your time and effort in putting out quality videos and detailed narratives on your projects. Jay, that table top looks fantastic and I really like the idea of the sprung headboard! Very nice, Jay. 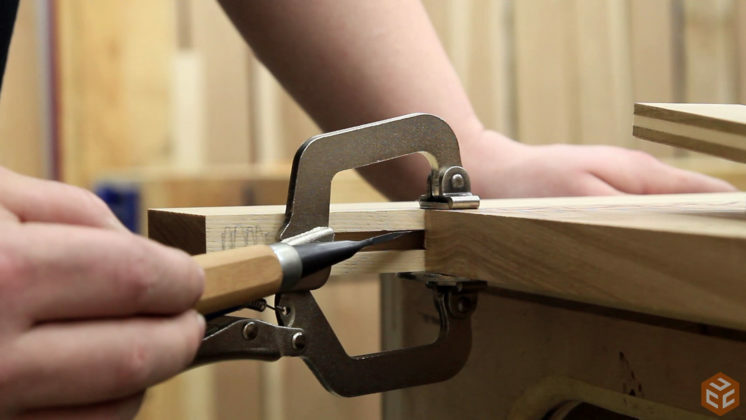 The through tenon with the wedges is a good idea. Very nice build Jay. 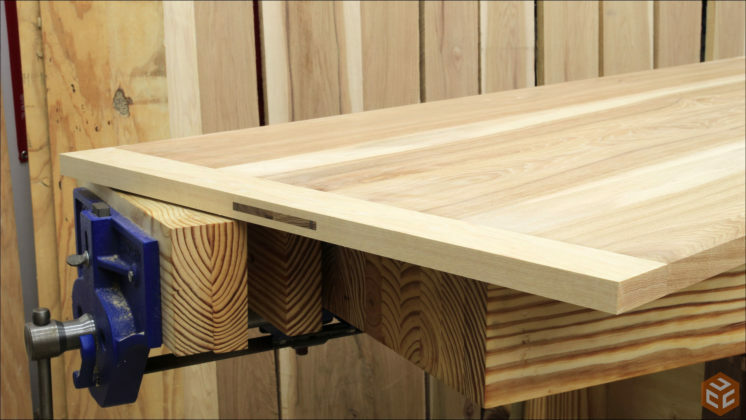 I like the joint for the bread board ends. The hickory looks fantastic. I appreciate it, Earl. Thank you. Always enjoy your videos and I usually learn something too! Thank you very much for the feedback, Peter. Perfect table top Jay; very small mistake – not even noticable. Makes me want to go and build a table for my eating area. Can’t wait for next week’s video. Nicely Done! You have a great way of presenting and it’s good to know things don’t always work out as planned for you also. Excellent recovery ! Thank you very much for the feedback, Mitchell. 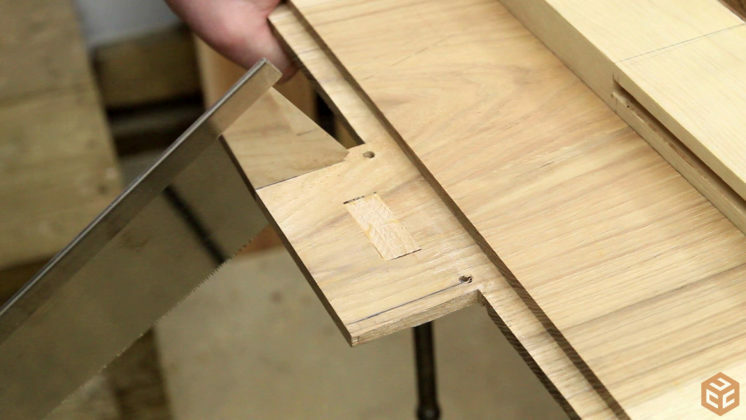 Great idea for the joinery for the bread board, the wedges when you made the clearance cut for them when you hammered them in is there any worry that the “dovetail tenon” would split? I have never done this so just asking questions for my own info. How about dowels from the top thru the dovetail tenon would that work too? Dowels through the dovetail tenon wouldn’t add much at all as the dovetail is doing all the work. 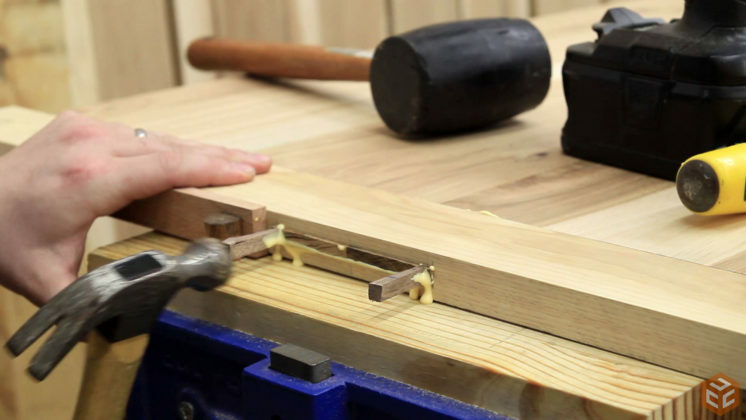 Dowels through a regular tenon would take the place of the dovetail connection. No risk of splitting as I didn’t bend it much. I only went about 1/8″. Nice Jay! Never seen a bread board end done this way. Fussing with a draw bored joint is time consuming and I’ve ruined a few. Going to try this next time. Very cool, Bob. This was definitely something new for me too. Love the way you explained this one, and the fact that you didn’t gloss over the mistake, every one if us makes them occasionally. Great work as always Jay. As for the wedge don’t freak out to much. GREAT WORK JAY! Can”t wait to get my building done to make room for the bigger projects.I like your videos and have polished my work from watching. Keep up the great work. This hickory was kiln dried. I actually had very few problems working with it. Just keep the tools sharp. 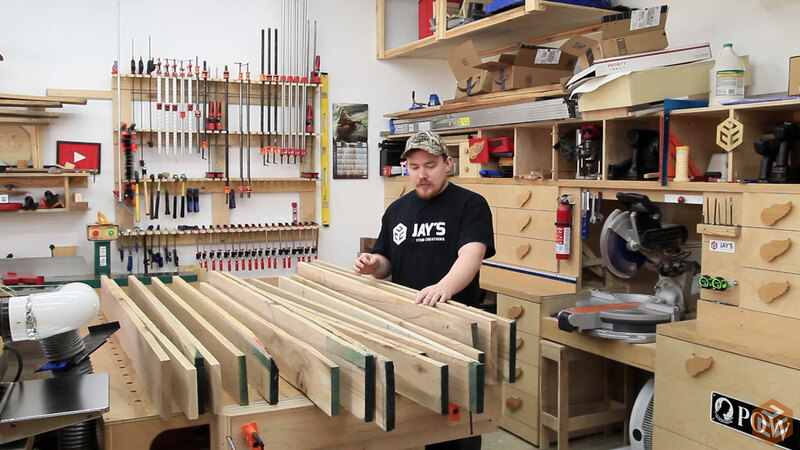 That is one beautiful table top, Jay. I myself would proably have buildt it with twice the thickness. Thick, heavy tables are beautiful! Your craftmanship is outstanding! The video is also top notch! Keep up the good work! As usual, a great, great video, Jay. Entertaining, but most importantly, very informative. Shouldn’t you slap at least one coat of protection on it right away? Love hickory. Thanks Paul. Id rather not get out the finishing supplies until I’m ready to complete the entire process. Great-looking job; makes me envious I don’t have your skills – and patience. I noted as you were driving the wedge that it looked short. My first thought was to insert a thin screw and try to lever it out. Not saying it would have worked, though. Always enjoy your projects. I envy all that wood you have stacked up. I just bought 2, 1x6x8ft Pine and it cost $20.00. Tough on a fixed income. Great craftsmanship and great description with lesson learned at the end about the wedge. I’m impressed with your attitude and how you were able to combat the problem with ease. I do have questions though. I am hard of hearing so I wasn’t able to hear the whole thing. 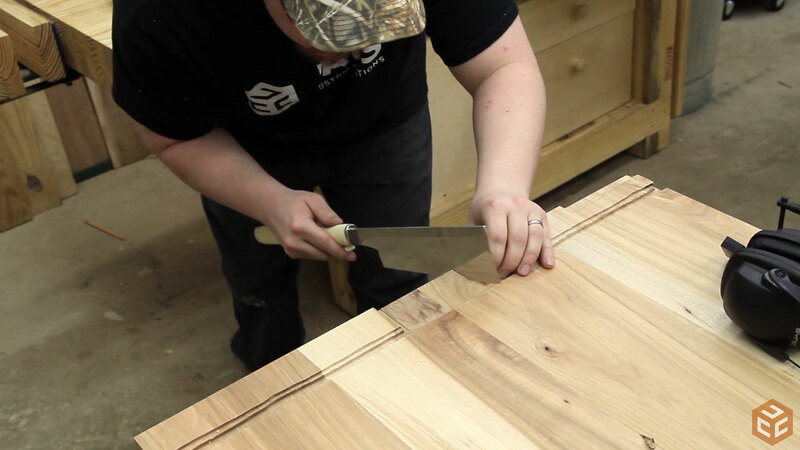 What led you to pick hickory for dining table and what causes you to do breadboard due to wood expansion naturally? Thank you for the kind words, Thomas. 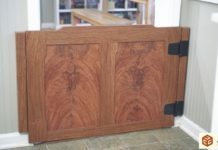 My two choices for wood were hickory or cherry and I chose hickory because I like the somewhat rustic look you get when sapwood is involved and you use a clear coat. I’ve also never worked with hickory so I wanted to give it a try. I’ve also never done a breadboard end before so I figured I would give it a try as well. 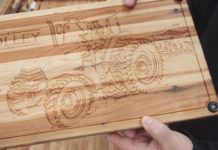 Interesting combination of wood and great technical design for the breadboard. Thank you for taking your time. Very informative Jay. Thanks for sharing your skills. I enjoyed as always. Top looks great. 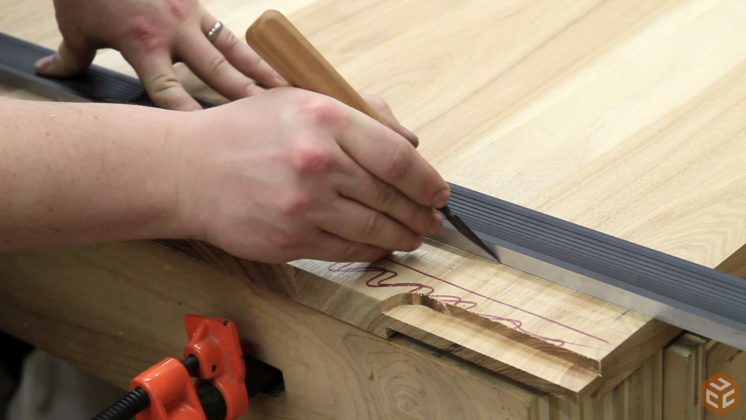 I will have to borrow your technique on the breadboard ends. Keep them coming Jay. 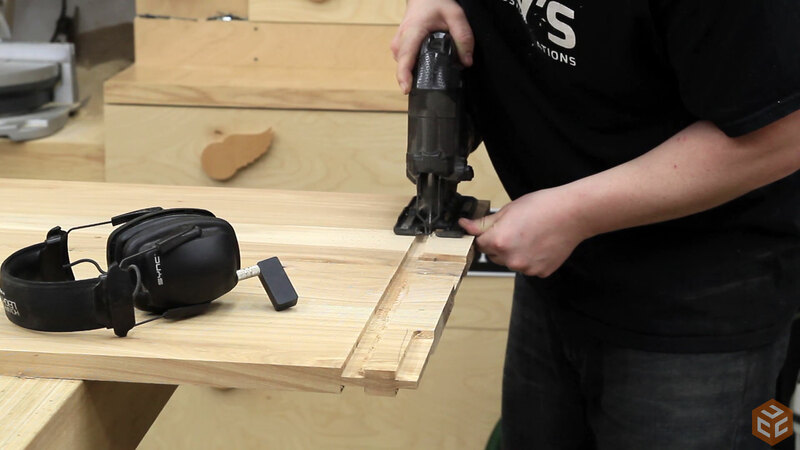 I love your how you are transitioning to hand tools. I need to make one of those work benches too. Table top is looking nice. Well done Jay, love the craftsmanship of that table. Very cool top. I really like the breadboard ends; I have plans to build an outdoor table for our deck this summer. I may try your method, I have never done that before but that’s no reason not to do it. I will be using pressure treated boards is there any thing I need to be warned about? I like your videos and your teaching style. God Bless my friend. Great video. I didn’t realize that breadboard ends were more than decorative. I love the pace of your videos, keep it up! I admire your ability to get up in front of a camera and do what you do. Wish I could do that! Thanks for all the video, keeps me motivated! That’s awesome. Beautiful wood. 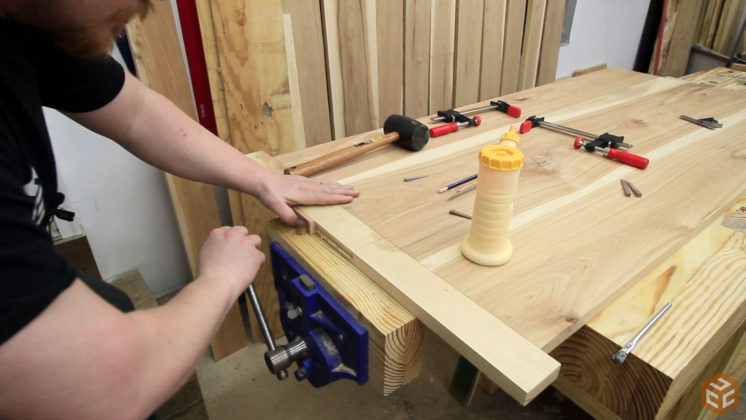 I never realized that was the purpose of the breadboard end– I thought it was just to cover the end grain. One quick question–how much room, if any, did you leave for horizontal expansion in the groove? That is, how much wider (side to side) is the groove than the tongue? Jay, I am glad you started posting your progress on this project. I purchased 200 bf of hickory a few months ago and have since read some negative posts about how difficult the wood is to work with. What are your thoughts so far? I love the natural color in Hickory. Can’t wait to see it once you have it sanded and sealed. Keep up the posts. The table top looks great! 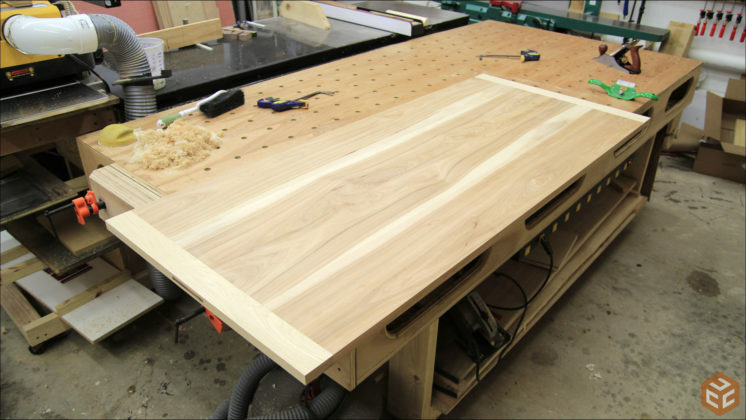 Great breadboard Jay – the tenon looks very cool on that table, and I like the wedge over dowels I’ve seen on other tables. Thanks for a great ‘how-to’ lesson! 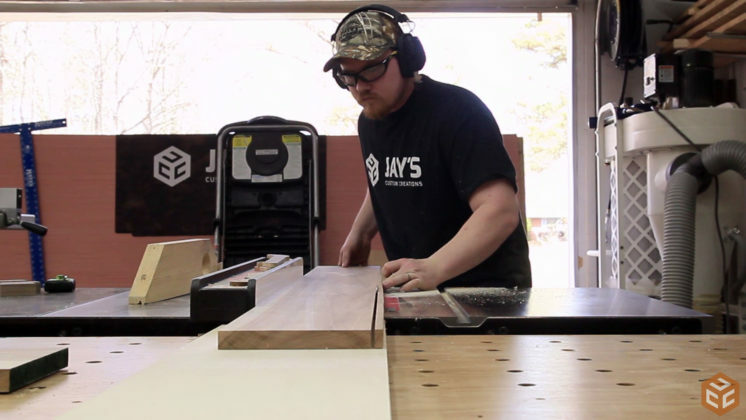 Great video of building the tabletop, Jay. The step by step was so easy to follow. Made it seem I was there in person watching. You make building look so easy. Job well done! I find your site very interesting. I am not yet into making furniture, but am looking forward to trying it in the future. I seem to learn a little something every time I watch a video. Thanks . Great work Jay. Couple questions. Once the top is all glued up do you go down every single long joint with the cabinet scraper or do you plane the entire top then sand? And what is the final prep before stain you talked about? Thanks! Hey Scott. Most of the time I wait until the glue-up is dry and then take a pull style paint scraper to clean up the glue squeeze out before planing. Recently though I’ve been using a wet rag to remove as much of the glue squeeze out as possible while it’s still wet. Final surface prep depends on what finish will be used. 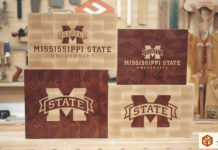 A cabinet or card scraper will leave a finish ready surface. 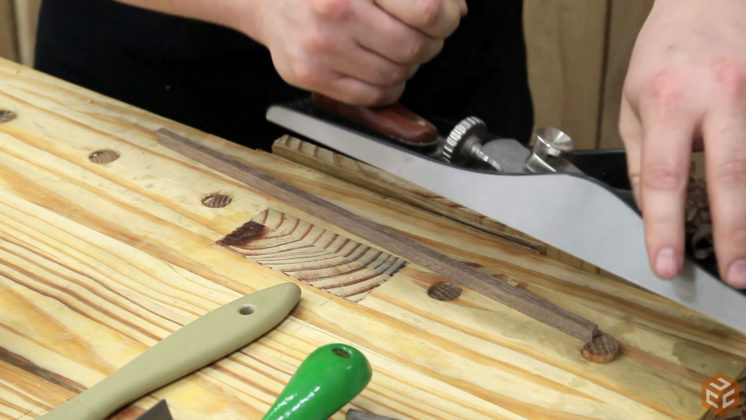 If a water based finish will be used it is necessary to use water to pre-raise the grain and then sand down the fuzz before applying the finish. Thanks Jay! A video on the final planing would be great! it is the part i have most trouble with. Thanks again.